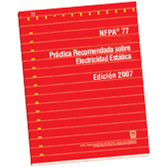 Prevent fires and explosions with proper identification and control of static electricity using the 2007 Spanish edition of NFPA 77. In addition to being a danger to individuals and an operating problem in industry, static electricity is often the ignition source for an ignitable mixture. Guard against fires and explosions using the latest best practices outlined in NFPA 77. You'll access clear guidelines for the assessment of ignition potential and protocols for fire prevention.